As the human footprint spreads, the need to reduce per-capita effects on natural resources has become more urgent. Educating large groups of consumers about the sustainability of not only their individual actions, but also broader economic and political structures, is a huge conservation challenge. Boredom and despair about environmental issues can also stagnate progress. Chief among these issues of concern is water use (supply) and water quality (pollution). The project, led by School of Aquatic and Fisheries Science Research Scientist Lauren Kuehne, seeks to overcome these challenges by using games built around key conservation topics. 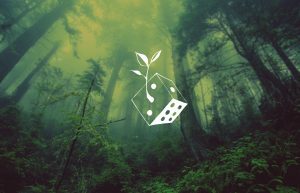 In addition to being fun, games are especially well suited to communicate environmental issues. They can accommodate complex relationships efficiently – such as the connections between water supply in a river and the health of animal populations. Players also learn through interactivity, where they are choosing directions and outcomes. Finally, and possibly most importantly, games incorporate emotional content and storytelling—some of our best conservation tools. The nitty-gritty of the project entails development of three unique environmental games, which will be deployed on mobile kiosks in high-traffic locations across campus for six weeks during Winter QTR 2019. In the game focused on water conservation, players start with a brief and playful idea about their own water footprint before they enter a “challenge mode” (sorry, no spoilers here!). The game idea was developed with help and ideas from the Cascade Water Alliance, a nonprofit with years of experience in education and outreach. In turn, we are designing the game to be useful to Cascade Water Alliance (and other organizations) in their work once the UW campus portion of the project is complete. A carbon emissions game and a trash/recycling game are also in development, and the team is working in similar ways with student, research, and nonprofit groups in these areas. Overall, the project seeks to educate players via exposure to environmental topics in new ways, but also evaluate if and how “gamification” can change awareness, motivation, and behavior. Our goal is that 2,000 players will interact with the kiosks over the six-week period, and we will follow up with them over time to evaluate impact. The interdisciplinary project team includes Lauren Kuehne (Research Scientist, SAFS), who wrote the project proposal to the UW Campus Sustainability Fund in collaboration with PhD Candidate Travis Windelhardth at UW’s Information School, undergraduate students Cailin Winston (Biochemistry) and Caleb Winston (Computer Science). The project proposal was based on a year-long feasibility study, which was implemented at UW in 2017. This diversity of the team is crucial given that the project incorporates everything from ecology to game development to behavioral psychology. In addition to expertise of the project team, we are also drawing in experts across campus from research groups like Earthgames, student groups such as GameDev Club, UW environmental scientists (like those in Freshwater Initiative! ), and non-profit organizations like Cascade Water Alliance and ECOSS. Other project partners include the Buerke Center for Entrepreneurship and UW’s Housing and Food Services. But we can still use help! We are happy to work with volunteers, student groups, or other organizations that can help with game design and development, outreach and promotion, or making use of finalized games in the future. Contact Lauren Kuehne (lkuehne@uw.edu) for more information or to help with this project!